Former action sports star Biker Sherlock lived loudly, but at the time of his suicide in 2015, he had become a different person -- anxious, confused and despondent. Solving the mystery of why became imperative for his widow Amy to move on. Amy Sherlock was in the kitchen preparing dinner when she noticed her husband was gone, not in the physical sense, but in a way that each day caused her more and more alarm. Biker, the nickname her husband, Michael, had been known by since he was a boy, was sitting on the couch in the family room, his hands in the pockets of his hoodie, his eyes gazing in the direction of the television. The lights in the room were off, and so was the TV. Biker had not been himself lately. In the past few months, she'd watched him transform from the cocky, self-assured, decisive man she married into someone riddled with anxiety, depression, sleeplessness and confusion. He was moody and withdrawn. On rare occasions, such as a moment during Thanksgiving dinner the previous week, he showed a spark of his old self. Amy would go so far as to say he seemed happy that day. But most days, tackling simple tasks such as buying a new pair of shoes, helping their older son with his math homework or preparing chicken and rice for lunch could reduce him to tears. His body language had changed, as had his walk. Gone was the confident swagger that had attracted Amy 20 years ago. "Even the muscles in his face looked different," Amy says. As she watched him from the kitchen, she wondered, Where is the Biker Sherlock who won four X Games gold medals in street luge racing, set world records, helped to organize the first Gravity Games and had his own action figure? Who are you? she thought as she watched the man on the couch stare at a blank television screen. Where are you? Amy dried her hands, walked into the family room and sat down next to Biker, 47. "He seemed distraught," Amy says. "He told me, 'I need to go for a drive and clear my mind.'" It was around 9 p.m. on Dec. 2, 2015, when Amy's husband walked out the front door of their La Jolla, California, home, keys in hand. "The last thing I said to him was, 'Do what you've got to do.'" Amy Sherlock lives in La Jolla, California, with her two sons and their 6-month-old Maltipoo, Tucker. Like she did every night, Amy helped their 4-year-old son, Steel, get ready for bed, and then she crawled into bed herself. Biker was a snorer, so he often slept in the spare bedroom, and Amy didn't notice when he didn't come home that night. When she saw his unmade bed the next morning, "tears welled up in my eyes," she says. "I knew something was incredibly wrong. But I never thought suicide." Throughout the morning of Dec. 3, Amy clung to hope and routine. She dressed Steel, poured him a glass of milk and cuddled with him on the couch while he watched cartoons and she sipped coffee and scrolled through news sites on her iPad, just like they did every morning. Shortly after 7 a.m., she read a headline on NBC San Diego's website, and her reality began to crumble. "Suspicious death reported in La Jolla," it read. 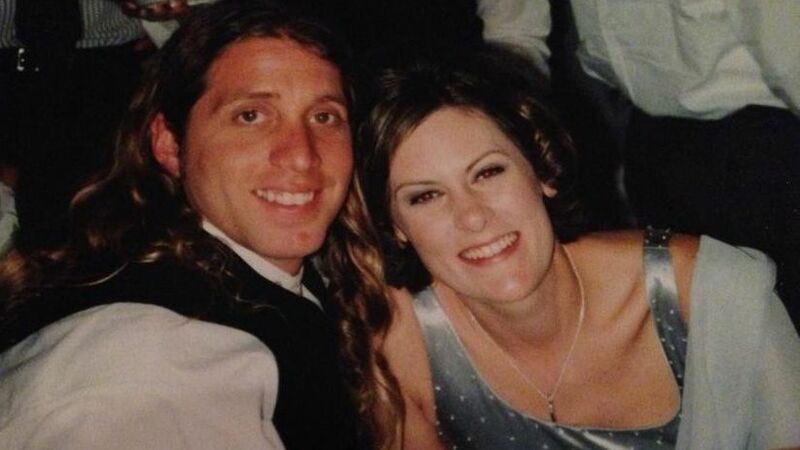 The story went on to identify Bird Rock, an area where Amy knew her husband loved to surf. She sent the story to Biker's best friend, her brother-in-law, Steve Lake, and asked him to check Biker's favorite surf spots. By the time she returned home from dropping Steel at school, Steve was in her driveway, tears in his eyes. "I'm so sorry," he said. In that moment, Amy's life fractured in two. Behind her was the life she'd lived for 42 years. In front of her was a life in which she would become a widow, a single mother of two young boys and on her own for the first time in her adult life. It was not a reality she was ready to step into, nor one she believed she had the strength to undertake. What she did know was that, before she could move forward, she needed to make peace with the past. After her husband's death, Amy Sherlock has needed to find strength to move forward as a single mother of two boys. 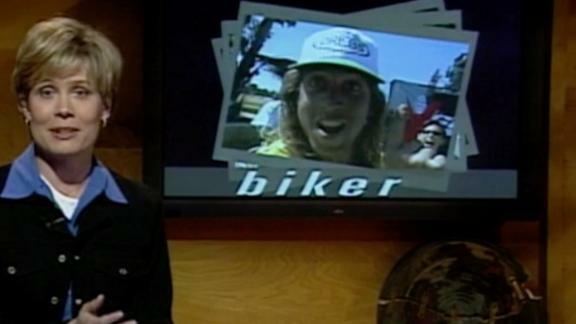 IN THE LATE 1990s, Biker Sherlock was the hard-charging front man for extreme sports, a pop-culture icon and household name in homes where ESPN's X Games and NBC's Gravity Games were must-see TV. He was a divisive figure, a man fans loved to hate almost as much as they loved to watch win. He was loud, brash and arrogant, distinguished by his neon-yellow-and-green racing leathers and pot-leaf graphics and known for smack-talking his competitors in interviews and even knocking them off course during races. On a street luge or skateboard, he was skilled. He was the 2000 downhill skateboarder of the year and multiple-time world champion in street luge, a sport that saw athletes lay on their backs on 8-foot aluminum sleds and race down steep, paved roads lined with hay bales. Off the board, he was seductive. In 1999, "Advertising Age" called Sherlock "the Bruce Jenner of extreme sports" and asked readers if he were a counterculture rebel or brand icon -- or both. That year, the Los Angeles Times anointed Sherlock the "Speed Racer of Street Luge," and a New York Times piece heralded him as the "many medaled Carl Lewis of the X Games." Biker Sherlock waves at his opponent as he passes him in a come-from-behind win during the 1998 X Games. But Sherlock had another side, one that endeared him to those who knew him as more than a television character competing in a wacky sport. A New Jersey native, Sherlock was a reliable friend and savvy businessman. To help street luge and downhill skateboarding gain entry into the Gravity Games, he used his Seton Hall business degree to create Extreme Downhill International, which became the sanctioning body for both sports, and he took a position with NBC, where his dad, Mike, was an executive, as a consultant to their upstart event. On the back of his X Games fame, he started Dregs Skateboards, a longboard skateboard and accessory company that also sold a $1,800 Biker Sherlock street luge. He employed and sponsored his friends, many of whom had followed him from the Jersey shore, where he'd spent summers as a kid, to the beaches of North county San Diego. It was those friends who, 20 years earlier, gave Sherlock his nickname, anointing him "Mike Bike," a play on the character "Mike TV" from "Charlie and the Chocolate Factory." "Even as a kid, Biker always had the best toys," says lifelong friend Bob Gawel, a New Jersey native who lives in La Jolla. "He was always on a BMX bike or a dirt bike." When Sherlock's parents balked that both were too dangerous, he left them with friends at the shore and rode them secretly during the summers. "Biker was always doing things a little faster, a little louder, with a little more confidence than the next guy," says Todd Lehr, a childhood friend who followed Sherlock into the sport of street luge and worked with him as a stunt man on the 2002 movie "Rollerball." "He didn't change a bit up until the day he died. He was a radical character." Amy met Biker shortly before her 23rd birthday at ASR, an action sports trade show in San Diego. Her sister, Kelly, was attending in support of her boyfriend, Steve, and his new longboard skateboard company, Sector 9. Biker was one of Steve's athletes -- a long-haired surfer who had just started racing skateboards downhill. "Everybody in the skateboard industry was talking about him," Amy says. "I told my sister, 'Anybody named Biker, I've got to meet.' She told me he wasn't my type." When Amy and Kelly approached the Sector 9 booth, Biker was holding court, bragging about how he would win every race he entered that season. Where Kelly saw bravado, Amy saw a man who was charming and self-assured. His confidence drew her in, but she didn't agree to go out with him for nearly four months. On their first date, he took her to the Chart House to celebrate her birthday, and they talked about family and ambition. "We were never apart after that day," she says. When Amy and Biker started dating, she didn't know much about the sports in which he participated. She'd grown up in Huntington Beach, California, where surfing and skateboarding were ingrained in the culture; she'd tried surfing a few times, but it wasn't her sport. In high school, she played indoor volleyball and traveled to three continents as an exchange student. While downhill skateboarding and street luge racing were gaining traction, Amy was studying international relations at the University of Southern California. The first few street luge races she attended with Biker didn't spark much worry. The hills were small, and he won easily. Still, she marveled at his confidence, at how he never seemed nervous and slept like a baby the night before races. She envied the ease with which he handled crowds and fans and cameras in his face. At the 1997 X Games in San Diego, Amy stood at the bottom of the steepest hill on which she'd seen him compete, surrounded by television cameras and his family, and for the first time, she felt the heavy reality of dating Biker Sherlock. That day, she stood with his mom, Ann, and witnessed the palpable anxiety of a mother's fear for her son. Amy and Biker didn't have kids at the time, so Amy didn't yet understand. She told herself she would let Biker's mother worry for him. If she was going to date a man who raced downhill at 70 miles per hour, she needed to support him fully. "I saw how it was ripping her apart and realized I couldn't worry like that, too," Amy says. "I needed to be his biggest fan." That wasn't always easy. Over the years, she watched her husband crash and lose consciousness, then get back on his skateboard or street luge and win the next race. She nursed him through broken bones, countless concussions and, after a crash racing BMX in his 40s, a surgery to remove his ruptured spleen. She felt the judgment of women who didn't understand how she could support the man she loved as he took such incredible risks. "People would ask him, 'Aren't you afraid you're going to get killed? Do you want to die?' I remember one interview where the reporter kept asking him, 'Do you have a death wish?' and he'd say, 'I love life more than anybody. I would never want to end my life doing these things. I love life too much,'" Amy, 43, says. "He never would have wanted to miss out. He wanted to be here. The contradiction is amazing." Amy met Biker shortly before her 23rd birthday at an action sports trade show in San Diego. At the time, Biker was new to the downhill skateboard racing scene. After their first date, "we were never apart after that day," she says. In the late 1990s, Biker Sherlock was the hard-charging front man for extreme sports. He would go on to win four X Games gold medals in street luge and set world records. Biker was a divisive figure. He was loud, brash and arrogant, distinguished by his neon-yellow-and-green racing leathers and known for smack talking his competitors in interviews. But he was very skilled on a skateboard. On the back of his X Games fame, he started Dregs Skateboards, a longboard skateboard and accessory company. He employed and sponsored his friends, many of whom had followed him from the New Jersey shore, where he'd spent summers as a kid. By the time Biker became a dad, the X Games and Gravity Games had dropped downhill skateboarding and street luge. He spent most of his time working on Dregs. "He loved his boys so much," Amy says. This was their last family photo, taken in October 2015. THEIR WEDDING RECEPTION was a rager, held in Calumet Park on the bluffs overlooking the popular La Jolla surf break where Biker and his friends surfed most mornings. By that October day in 2000, the lawn, as they affectionately referred to the park, already held so many memories for the newlyweds. It's where they drank coffee together and watched the waves on Sunday mornings or shared an ice cream while discussing plans for the weekend. After they were married, Amy and Biker waited four years to start a family. But when they decided they wanted children, Amy got pregnant on the first try. That was so Biker; when he made up his mind to do something, he did it right the first time. Titus Michael Sherlock was born Oct. 13, 2004; Amy named him for Hawaiian big-wave surfer Titus Kinimaka, a close friend of theirs with whom they had spent many vacations in Kauai, their favorite home away from home. It was a big name, an important name, but it wasn't Biker's name. Amy didn't want their son to feel he had to live up to Biker's reputation. Six years later, when Amy and Biker learned they were pregnant again, they brought Titus to Calumet Park to tell him he was going to become a big brother. "It's just a special little place," Amy says. People always ask Amy how having kids changed a man like Biker Sherlock. They want to know if it slowed him down or made him re-evaluate his life and the risks he took. But by the time Biker became a dad, his life had already changed. The X Games and Gravity Games had dropped downhill skateboarding and street luge in 2001, and while Biker surfed most mornings, rode his dirt bike and still lined up for the occasional downhill skateboard or off-road trucks race, he'd hung up his street luge for good and spent the majority of his time working on Dregs. Having kids didn't slow him down, but it opened his heart in ways even he didn't know was possible. "He loved his boys so much," Amy says. "He was a great dad." Amy Sherlock has brought her son Titus, right, 12, to see grief counselors and is learning how to tell Steel, left, 6, what happened to their dad. The first signs that her husband was depressed didn't set off alarms. Everyone feels down some days, especially when they're faced with a major life change. It was early 2013 and Dregs was struggling. According to Biker's longtime friend and business partner, Beau Torres, the company wasn't growing like it once had, although Dregs still had orders coming in and inventory to fill them. Gradually, Torres noticed his partner becoming more stressed with their situation than he felt was justified. "I didn't know what got into him, but he couldn't focus," Torres says. "His organizational skills started deteriorating. Everything seemed so dramatic and tragic. It wasn't Biker." One day, Torres came into work to find Biker had let go of their final employee, their bookkeeper, Stephanie. "He asked me why I was there," Torres says. "He said, 'We're done.' Within three days, we were shut down." The move came as a surprise to his friends and family, not because of its finality, but because of how out of character it was for Biker to make snap business decisions or behave so pessimistically. "To hear him defeated was shocking," Torres says. "None of us were defeatists. We all had our fair share of things go wrong, but we were raised to take them and learn from them." Margaret Sherlock, Biker's oldest of three sisters, spoke to her brother nearly every day. She was an attorney in New Jersey, and he often called her for business advice, but not this time. "He loved Dregs so much, and it didn't seem to make sense that he couldn't make a go of it anymore," Margaret says. "At that point, he was down and depressed." 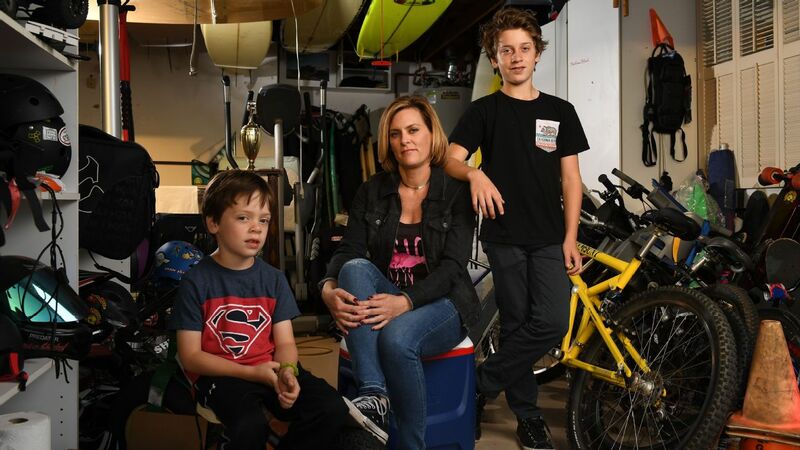 Worried and wanting to help him through the process of closing his business, Biker's parents and his sisters flew to La Jolla from New Jersey for a couple of weeks to stay with Amy and Biker. They helped him file paperwork, list items for auction and provide emotional support. He had always been there for them. When Hurricane Sandy hit the year before, Biker was on the first plane to New Jersey to make sure his family was OK. Now it was their time to be there for him. "[We] would take turns counseling him," Amy says. "He would lie on the floor and cry. We told him, 'You're going to get through this. It's just a business. You did great things for 14 years. You employed people.' There were days I'd pet him and say, 'I understand. It must be so hard.' Other days, I'd look at him and go, 'Get up. What the hell? You can crash a truck in a race and get back up. This is easier.'" With the help of Amy and his parents, Biker placed Dregs up for auction, as well as his cars, boat, jet skis, dirt bikes and race truck. "We auctioned off almost everything," Amy says. "Then I started digging in deep." To buy her husband time to figure out what he wanted to do next, Amy went back to work as a pharmaceutical rep, her career before having children. "We had money coming in, and he started to get back on his feet," Amy says. Slowly, the fog started to lift. When he told her he had an idea for a new business, that he wanted to open a medical marijuana dispensary, she saw the same passion and energy he'd once had for skateboarding return to his eyes. He seemed focused and present. "It wasn't overnight," Amy says. "But I remember coming home one day and being like, 'Wow, Biker's back.'" Adds Margaret: "It seemed like he was jump-starting his life again." IN FALL 2015, the cloud had returned. Though this time, his depression seemed to spiral out of control quickly. He'd been working on his new business, taking several steps forward, but permits were tougher to obtain than he'd planned, and laws were changing seemingly by the hour. To Amy and Steve, who was also helping with business advice, the setbacks seemed par for the course, but Biker responded as if each obstacle was insurmountable. "There's that level of intensity that certain people have that separates them from others. Biker had that, and I watched it disappear," Steve says. "I watched him go from this intense individual to a weak, struggling, desperate, depressed man. That sense of weakness and helplessness terrified me." The more delays and speed bumps, the harder it was to convince him there was an end to the road he was on, that he would again provide for his family and make his parents proud. "I think he felt like he was letting all of us down," Amy says. In the last few months of his life, he stopped sleeping; although he saw his doctor, who prescribed sleeping pills and an anti-depressant, little changed about his behavior or ability to sleep. He was confused and overwhelmed, and his judgment was impaired. He still smoked pot at times, and even that didn't help him sleep. He knew something was wrong, but he couldn't put how he felt into words. "He complained of not being able to think straight," Margaret says. "He was overly concerned about the well-being of his children. He was unable to do tasks that should have been easy for him. He would say, 'I don't know what to do. My head is a mess.' I'd say, 'Go for a bike ride with Titus, clear your head.' I'd call later and ask if he'd gone for that bike ride, and he'd say, 'No. I couldn't get it together.'" One day, Amy found her husband in the kitchen struggling to remember the correct order of steps required to prepare rice and chicken, a meal he'd eaten almost every day of his life. "At the time, it just seemed like somebody who had a lot on his mind," Amy says. Then she started noticing the physical changes -- the way he walked and talked, the way he sat in his chair at the computer. "Those last few months, he seemed withdrawn, worried. I remember looking at him one day and going, 'Who is that? It looks like there's a different person in my house.'" Amy Sherlock's garage is filled with pieces of her husband's past. It took her months to start clearing it out to make space for her car -- something Biker never would've approved. BY THE TIME of his death at age 47, Sherlock had faded from the action sports consciousness, replaced by names such as Travis Pastrana and Ryan Sheckler and Shaun White. He was no longer a star, but a husband and father and a man struggling to understand what was happening inside of his brain. His death went largely unacknowledged, aside from a few message board posts and news stories written the day his body was discovered on the beach near stairs leading to one of his favorite surf breaks, a self-inflicted gunshot wound to his head. That night, Biker's best friend, Steve, called Dr. Mark Cooper, a longtime friend and clinical neuropsychologist based in Solana Beach, California, to ask if he would be available to counsel his nephews, who'd just lost their father to suicide. The longer they spoke, the more intrigued Dr. Cooper became with Biker's story. He'd spent the early part of his career on the East coast, training at the Yale School of Medicine and Columbia University, working with NFL players and studying head injuries and chronic traumatic encephalopathy, or CTE, a neurodegenerative disease that can lead to dementia, memory loss and depression. The story Steve was recounting -- concussions, behavior changes, depression and sleeplessness -- sounded all too familiar. "I started asking questions, and the more I learned, the more apparent it became that this was textbook CTE," Dr. Cooper says. A few days after that initial call, Dr. Cooper drove to the Sherlocks' home in La Jolla to meet with Amy, Biker's family and a group of close friends. During the meeting, Biker's sister, Marjorie Kavanaugh, recounted the fractured skull her brother had suffered in a BMX accident when he was 7. She told them Michael, the name Biker's family still called him, had lost count of his concussions. Amy told Dr. Cooper about her husband's on-again, off-again career racing off-road trucks and the fall he had taken while skateboarding about six weeks before his death, and that despite wearing a helmet, something Biker had always been vigilant about doing, he hit his head so hard she was surprised he didn't lose consciousness. "Dr. Cooper asked a lot of questions about Michael's life and injuries, and he was very tender and understanding," Margaret says. "At the end of the conversation, he looked at my parents and said, 'Based upon what you have told me, there is no question in my mind your son suffered from CTE.' Then he went on to explain CTE. Prior to that day, I didn't know anything about it." Amy had heard the term connected to football players. Biker's friends, most of whom also grew up surfing, skateboarding and riding motocross, had heard of CTE. They'd seen the movie "Concussion" starring Will Smith. They lived in San Diego and remembered vividly the death and subsequent CTE diagnosis of Chargers Hall of Fame linebacker Junior Seau. But most of them never made a connection between the concussions football players sustained and those they themselves had suffered throughout their lives. They still considered CTE to be a football problem. "In some regards, concussions were badges of honor," childhood friend Todd Lehr says. "I remember guys bragging they'd had a dozen or more. I'd seen Biker lose consciousness more than once. We thought if you didn't lose consciousness and could remember your name, you were fine. But you weren't fine. It was the long-term effects we didn't know about." In retrospect, Amy believes if she and Biker had known what they were dealing with, although it might not have changed the ending to his story, that knowledge would have helped her. It would have removed the fear and uncertainty and might have altered the way she handled those last few months. "If even one person can recognize their situation in mine and do something about theirs, then this is worth it," she says. "That's why I'm able to do this." Amy Sherlock's son Titus used to race trucks with his dad. Amy has since pulled the plug on that activity out of worry for Titus' health. THE FIRST FEW months after Biker's death were a blur. As Amy scrolls through her mental memory bank, six months feels like two; a story that seems like it should fit into March actually took place in May. She began seeing a grief counselor, and then another, and she took Titus to talk with one, as well. She listened to their advice not to tell Steel how his father had died. He was too young, they told her. He wouldn't understand. One night, he asked Amy if a shark had eaten his dad while he was surfing. Still, she's held tightly to the advice she was given that he is not yet ready to know. Despite the help they provided, Amy struggled to connect with her counselors or find a group to which she felt she belonged. Suicide adds a dimension to dealing with death she didn't know how to overcome. When friends who lost their husbands to cancer or illness invited her out for drinks and told her they knew how she felt, she wanted to scream out to them that they didn't know. Their husbands had fought to live. Hers had made a decision to leave. He hadn't even left a note. "I'm not usually an angry person," Amy says. "It was hard for me to carry around that much anger." The empathy she saw for athletes in sports such as football wasn't there for her husband, either. She felt the judgment of people who didn't understand why she was so surprised he had died so young. Biker had risked his life for his sports, time and time again. She had supported him in doing so. One way or another, wasn't this end inevitable? She searched online and found support groups for women whose husbands had been diagnosed with CTE, but none for athletes who had been involved in action sports. Was it possible her husband was the first action sports athlete to die from this disease, if in fact he had? On one hand, she wished she'd known more about CTE, that she'd understood the proper protocol to have her husband's brain tested. But the days after his death were not meant for clear-headed decision-making and conscientious thought. Once Dr. Cooper brought the letters CTE into their lives, Amy and Steve called the coroner to request an autopsy and CTE tests. They'd learned from Dr. Cooper that, despite the fact that Biker's brain had been compromised by a gunshot wound, it was likely possible to collect enough tissue to test his brain for CTE. "I left a couple messages and thought the coroner would call back, that he'd go, OK, this could help humanity," Amy says. "But he never returned our phone calls." Biker's body was cremated before an autopsy was conducted or a neuropathological analysis of his brain tissue could be performed. "It was as if the decision was made for me while I was in this surreal wave of grief," Amy says. "But for me, it wouldn't have made any difference. I thought, 'Maybe this is how it should be.' I believe the test would have been positive, and I worry that if it came back negative, it would have been hard for his parents to accept. So maybe it happened how it was supposed to happen." Dr. Cooper had convinced Amy and Biker's family and friends that he had suffered from more than depression. But, while knowing what it was they'd been dealing with brought her comfort and answers, she still felt alone in her grief. She wished there was someone with whom she could connect. Two months and one day after her husband's death, Amy read another headline that stopped her in her morning routine. BMX athlete Dave Mirra, a onetime friend of her husband's, had shot himself near his home in Greenville, North Carolina. She didn't know Dave well -- she had met him only a couple of times at the X Games -- but she knew Biker was a fan. A bike Dave gave him as a gift still hangs in Biker's parents' garage in Hasbrouck Heights, New Jersey. They were similar men and likely had similar injury histories. Was it possible, she wondered, that this disease also contributed to Mirra's death? "I thought about Dave's family that day and wondered if his wife saw the same things I did," Amy says. "I thought, 'What a tragedy.' He was another person I would have never imagined would do something like that. It was confirmation to me there was something bigger going on here." In June 2016, Amy's hunch was confirmed when she read a news story confirming that Mirra had been posthumously diagnosed with CTE. She read an interview with his wife, Lauren, in ESPN The Magazine, and for the first time since her husband's death, she believed there was another woman in the world who understood what she was going through. Reading Lauren's words was like reading her own. "I thought you could change her name and put mine right in there," Amy says of the interview. "Lauren said she didn't recognize Dave anymore, and that quote she said several times -- 'Who are you?' -- hit home with me. I remember feeling like that, like I know you better than anybody in the world, and you're different." Steel Sherlock, center, has picked up jujitsu recently, and his brother, Titus, right, is exploring photography. Learning of Mirra's diagnosis confirmed for Amy the belief that Biker also suffered from the disease. But that knowledge wasn't the salve she expected it to be. Instead, it opened the door for more questions than it closed. Why, if there was a concrete link between concussions and CTE, didn't her husband's doctors make that connection when he went to them? Were more action sports athletes suffering with this disease, their wives and families unaware? If so, what could she do to help them? As she began putting the pieces of her life back together, Amy started to answer those questions as best she could. She found a grief counselor with whom she connected, encouraged her boys when they showed interest in new activities and returned to the Bar Method workout classes she loved to hate. She organized the garage and even cleared enough space to park her car inside, something Biker never would have approved of doing. And she shared her story. "Amy is so resilient and strong," her sister, Kelly, says. "She realized that she needs to take care of herself in order to be there for her kids. She needs to be gentle to herself." ON A BRISK morning in late September 2016, several of Biker's friends and family are gathered at the lawn, their surfboards and wet suits scattered in the grass. They sip coffee and make small talk with Amy and her boys as they wait for the surf to back off enough to accommodate the kids. Around 11 a.m., 30 people in the group suit up, place green leis around their necks and climb down the stairs from Calumet Park to the beach. John Holzenthaler, whom everyone affectionately refers to as "Hosey," carries a plastic container filled with Biker's ashes and holds Titus' hand as he navigates the steps. Out in the water, the surfers will form a circle, Hosey will say a few words and then scatter Biker's ashes into the ocean. It's taken nine months to organize this paddle out, a sacred ritual among surfers after the death of one of their own. The night Biker died, he did not leave behind a note or say goodbye. He chose a place to end his life where he must have known he would be found by someone he'd met in the lineup, someone with whom he'd shared a hello or a wave or a cup of coffee. That fact has been difficult for his family and friends, as well as many within the La Jolla community, to understand. Was it a final rash decision made by a bold egomaniac? Or, as Amy believes, did her husband go to a place he loved searching for solace and peace in hopes of talking himself out of a decision he'd already made? "It took us almost a full year to forgive him," Lehr says. "But we had to forgive. It doesn't do anyone any good to hold on to anger. He deserves a right to rest in peace." A few weeks after his death, Biker's family held a memorial service at Kate Sessions Park in La Jolla, and nearly 400 people attended. But today is more personal. For those closest to him, it's the first time they are openly confronting the circumstances surrounding his death and the role the sports they love might have played in it. Throughout the day, conversations begin with questions and end with more, but if there is a refrain among the group, it is that they have shifted how they view head injuries. While they once treated concussions no more seriously than a sprained ankle, they now do what they can to protect themselves and their children while still participating in the sports they love. "My mom didn't let us play football, but she didn't worry about skateboarding," Beau Torres says. "We didn't wear helmets. We didn't know. My kids, if they get on their skateboards without their helmets, they lose them for a week." The men do more than talk about the past, what could have or might have happened. They make promises to one another to be open and honest when they feel themselves slipping and have empathy for each other when they're in pain. "Biker would never have complained," Holzenthaler says. "It was always pedal to the metal. No time for weakness. Looking back on it, maybe he was struggling and telling me in his way, but I didn't listen. It's only in my 40s that I've learned the concept of empathy." Amy and Biker Sherlock were married on the bluffs overlooking a La Jolla surf break, and it's where Biker's friends held his paddle out, a sacred ritual among surfers after the death of one of their own. IT'S A WEDNESDAY afternoon in April, or jujitsu day, if 6-year-old Steel is telling the story. He's taken up the martial art recently, after switching from karate, which he found formal and boring. "Jujitsu is more hands-on," Amy says. "He wants to be a ninja." At this evening's class, Titus, now 12, plans to bring his camera. There's a Ferrari dealership next door he'd like to photograph, and the moon is supposed to be incredible tonight. Two years ago, Titus was racing trucks with his dad in the Lucas Oil Off Road Regional Series, but after Biker's death, Amy pulled the plug on his racing program, too worried for her son's brain. "He hated me for a couple weeks," Amy says. Then he found photography and video editing. A local production company saw his videos on YouTube and hired him to shoot interviews at the Lucas Oil regional races for an online video series called Mod Kids USA, so he could remain involved in the sport. "I'm so proud of him," Amy says. "He's found his passion. Titus is a talented athlete, so he would have probably followed in Biker's footsteps. Jujitsu is totally Steel's thing. It's cool to see them find their own paths." Amy is also beginning to forge her own. "Life shifts," she says. "It moves forward." This past Christmas, she bought matching pajamas for herself and the boys and had their names embroidered on them. She even bought a pair for Tucker, the family's 6-month-old Maltipoo. "Biker would never have done that," she says. "And he would never have had a foo-foo lapdog." On Biker's birthday in January, Amy bought four cupcakes and took the boys to the lawn, where they celebrated his "heavenly birthday" and talked about their dad. "I'm starting new traditions," Amy says. "And that's OK." She's thinking about redecorating the house, adding a few feminine touches. This weekend is Easter, and she plans to continue her tradition of starting something new, of honoring her past while creating a future for her family. "I never thought I could do this by myself," Amy says. "But I keep finding out, 'Wow, I'm way stronger than I ever thought.'" Alyssa Roenigk is a senior writer for espnW, ESPN The Magazine and ESPN.com whose assignments covering action sports, Olympics and football have taken her to six continents and caused her to commit countless acts of recklessness. (follow @ESPN_Alyssa on Twitter).